Universality is the philosophical concept that some truths exist regardless of the situation, place, or time. Some things are just universally true. That we will all die someday is a universal truth. Some would say the inalienable rights that our nation's founders fought for are natural, universal truths that cannot be augmented, fractioned, or disputed. I thought the same was true for butter. When has there ever been a food situation where adding a little bit of butter did not make the end product just that much better? More than the sum of its parts? Seinfeld would tell you that anything good and delicious was the result of adding cinnamon. He's wrong. It's butter. But when I first heard about people adding fat -- butter, coconut oil, etc. -- into their coffee for an added boost of energy in the morning, I thought they were daffy. 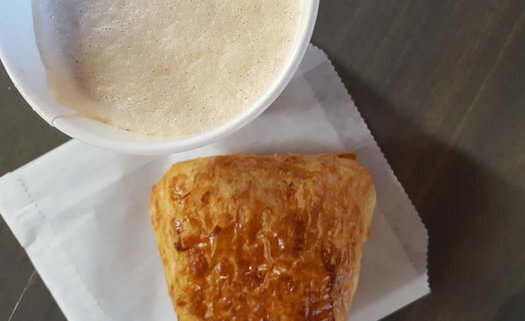 Isn't coffee wonderful enough on its own without being bastardized by pumpkin spice, blended up with ice, and topped with whipped cream -- or lubricated with a healthy knob of butter? Turns out that butter really is a universal truth. 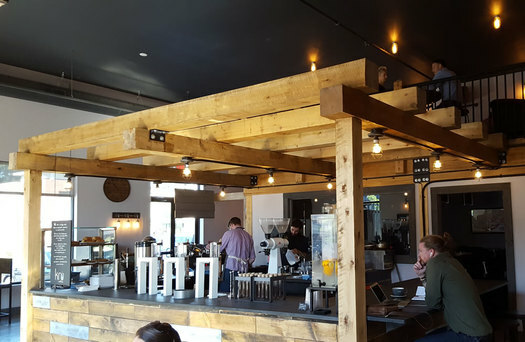 At Kru Coffee, the newest coffee shop in Saratoga Springs, bullet lattes ($5.50) have a prominent place on the drink menu, alluding to the popularity of the butter-added, steamed milk and espresso drink. A generous pad of butter (think 3 tablespoons, at least) was placed into a mini blender cup and topped with a pull of espresso before being whirred around by mechanical blades and mixed gently into a cup with steamed milk. The result is a velvety, luscious cup of caffeine with the added fat that proponents of "bullet" or "bulletproof" coffee herald as a benefit. Except I'm not sure I received any of those benefits besides taking pleasure in a fat-fortified morning pick-me-up. The butter used didn't seem to have the telltale color of grassfed milk, and no other heart-healthy fat was added (to my knowledge) into my cup. I didn't feel healthier, more energized, or without cravings. I just felt... caffeinated. The thing is, butter keeps. And it's easy to offer a fad product upsell when it includes little more than a staple menu item with an additive that you can hold on to for months if properly stored. It's smart marketing by Kru Coffee. But feeling I missed the true flavor of this new-age, West Coast-style coffee shop that's tucked away in a strip mall location that feels better suited for a Starbucks, I order a cup of regular coffee -- black -- to see how the actual coffee, which is roasted in house, stands up. That refractometer isn't the only gadget present at Kru: Vacuum-pump contraptions are the basis for "steampunk" coffee, and an open roasting area displays the equipment used to develop various fair trade, organic, or rainforest certified coffees from single-source producers. Take that one step further with the Brubender Concept Bar, a small room that looks like a neon-lit martini bar meets a reclaimed-wood cozy nook. Open on the weekends with limited hours, this concept bar makes coffee concoctions that mimic high-end cocktails. The "Keen Ice" is a listed as including "Spanish saffron infused milk, battenkill half & half, brown sugar bender espresso, cracked sea salt, raspberry reduction." The "Arrogate" is a complete nosh, consisting of gluten-free artisan cracker, Danish blue cheese spread, blood orange espresso jelly, local buckwheat honey, super ristretto espresso shot with Saratoga sparkling water and blood orange. 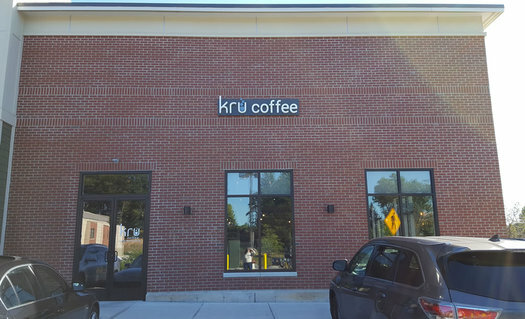 If you are looking for a solid cup of coffee at a reasonable price (16 ounces is less than $3), Kru has you covered. A flakey chocolate croissant (not made in house but procured locally) is an additional $3.50. There is wifi and Vampire Weekend on the sound system, with plenty of clean, open workspace and intimate seating for coffee-fueled tete-a-tetes. 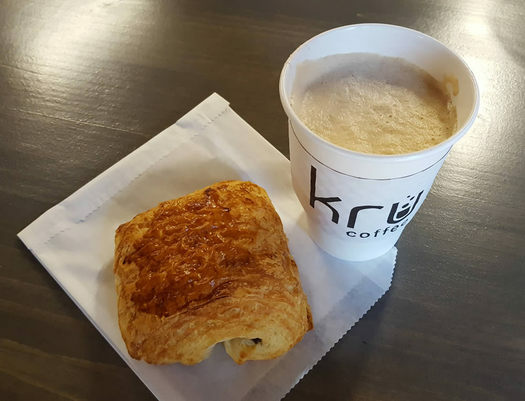 But Kru isn't a place that should be your morning go-to on your way to work. Kru's attention to detail is something that requires a similar approach to consumption. It's an experience, a place you come to engage in the art of coffee, that you sit, sip, and savor. Whether you gild the lily with a little butter is up to you. + Toast menu at Superior Merchandise Co. I love this place. I love their toys. Coffee geeks may appreciate the fact that they have two Slayer espresso machines. One out front and another in the Brubender Concept Bar. Not to mention the Japanese style cold brew towers, and something called The Dragon, which I'd never seen before.